Engineers and product managers from device and computer manufacturers and designers will meet in Taipei, Taiwan for a free day-long session hosted by Canonical Ltd. on Sept 24, 2010. 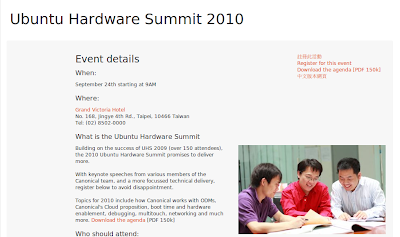 The commercial sponsor of Ubuntu will host its annual Ubuntu Hardware Summit(UHS), which includes keynote speeches from various members of the Canonical team, and topics ranging from how Canonical works with Original Design Manufacturers (ODMs), multi-touch, boot time optimizations, networking, hardware enablement, debugging and more. Over 200 attendees are expected to attend from all facets of the PC ecosystem. An overview of multi-touch support in Ubuntu, covering kernel drivers, the X input stack, and applications. A demonstration of Ubuntu multi-touch support will be provided. A general look at the debugging process of Linux Kernel suspend/resume errors, paying particular interest to a specific bug which caused weeks of pain for the presenter. An overview of how OEMs and ODMs can work more efficiently with Canonical to build successful Ubuntu-based devices. A session on the uTouch gesture suite that will make its first appearance in the 10.10.10 build of Ubuntu. The code is published under GPLv3 and LGPLv3. Updating from Ubuntu Netbook Edition 10.04 to 10.10 will automatically include uTouch and Unity uTouch. An explanation of issues to avoid and good practice to follow with BIOS and ACPI to ensure firmware works well with Linux the first time.